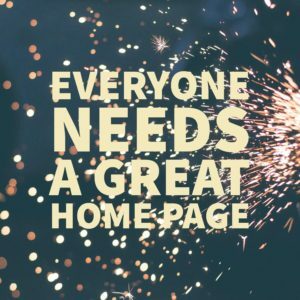 You get about 3 seconds to make a great first impression, so the home page must capture the heart and mind of your visitors. If it does, you have another 3 seconds to arouse enough curiosity to compel your visitor to want to know more. The solution to their problem must be obvious—both in words and design. It must work well, on all kinds of devices and for all levels of user expertise. Emotional connection. In the time it takes to make a first impression, a visitor wants answers to 3 questions: 1) who are you? 2) can you solve my problem? and 3) if you can, answer 3 visitor questions: who you are, what you do, and what’s in it for them. Visitors come to your page because they have a problem that needs solved. 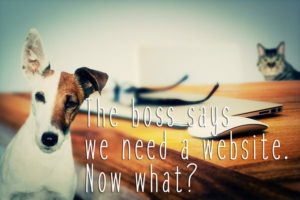 They are looking for a business or a person or a cause that will satisfy a need and make an emotional connection that motivates them to dive deeper into the site. Meaningful language. People connect visually, but they also connect through a common language. The home page is not the place for jargon or boasting, and definitely not the place for long paragraphs. Visitors will quickly scan for words and phrases, then buttons or links to learn more. Respectful. Avoid the use of flashy objects that move, make noise, or complicate or compromise the connection experience. If you offer a video, it’s considered bad manners to auto-start it. Same for audio. Let your visitor decide when or whether to engage in these sensory experiences. Device friendly. Visitors come to your site on their desktop computer at work, through a tablet at home or in the field, or a smartphone from about anywhere. A site that is not easy to navigate using a mouse or a finger, or can’t adjust to any screen size, lowers the probability that the visitor will stay on your site long enough to solve a problem, make a purchase, or engage at all. Actionable. Solve problems or offer information that make your visitors’ lives easier, like an obvious or clickable phone number, a sign up form that doesn’t ask for more than an email address, a social media link that actually works. Keep search engines happy too with relevant keywords, a textual site map, and a well-researched and tested page description meta tag. Your home page gets the bulk of site traffic, making it undoubtedly the most important page of your website. This is where you get visitors to dig deeper. This is where you convert traffic to leads, and leads to customers.